Over the last decade, banking has taken a virtual turn. Not only can you find brick and mortar banking facilities, but there is a new breed of financial institutions online that offer higher interest rates and cash back on services. While these are mostly of the self-service variety, these online institutions do offer some great customer service for even the computer illiterate. 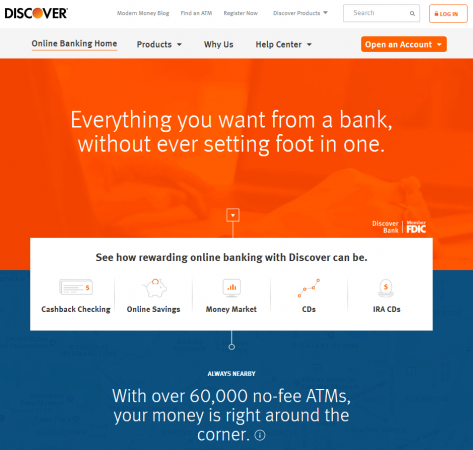 Topping the list of online banks is Discover Bank, which not only meets all your online needs but offers 24/7 call centers and more than 60,000 no-fee ATMs. Discover Bank was featured in the top ten list in Best Online Checking Accounts of 2018 by Nerdwallet and had a 4.5 (out of 5) star rating. It was also recognized as a CIO 100 Award Winner in 2017, which is an award for companies that are known for their technology and business innovations. Discover also has a long history of excellent service with the company's roots dating back to 1986. First and foremost, one of the reasons internet banking is taking hold is because they offer better rates and rewards than their brick and mortar competitors. For example, Discover Bank offers you 1 percent back in purchases up to $3,000 dollars every month. That means if you send $1,000 on a new furniture set, then you will get a reward of $10.00 back. With most checking accounts not earning you anything at all, this can be a great way to save a little dough. Additionally, Discover offers a savings account with a 1.50 percent annual yield and no minimum deposit with interest compounded daily and monthly instead of just monthly. For example, if you deposit $15,000, you'll earn $225.17 in a year. When you compare this to the national average of just 0.06 percent, this can be a great way to get more return on your money. In addition to their checking and savings accounts, Discover boasts CDs and IRAs. Their CDs run from 3 months to 10 years and offer interest rates from 0.70 to 2.42 percent. The IRA CD is available in both a Roth, which is funded by after-tax dollars, and a traditional, which is funded with pre-tax dollars. Going back to its roots, Discover also offers a variety of credit cards and loan opportunities. These include personal, student, and home equity loans. Another online bank contender featured among 10 Best Online Banks of 2018 by GOBankingRates is Ally Bank. Ally Bank has its roots in the auto industry with its history dating back almost 100 years offering auto financing in the early 1900s. 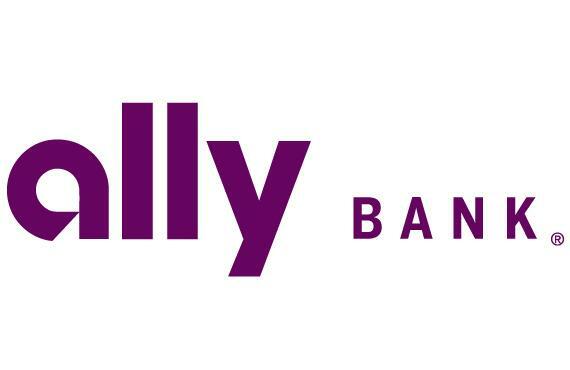 In 2009, the GMAC Bank transformed into Ally Bank, an online financial institution that won several awards in 2017. In addition to winning the MyBankTracker Best Bank Award for the third quarter of 2017, Ally also was a winner of the Detroit Bar Association Foundation Corporate Citizen Award and featured in Kiplinger's Best Internet Banks. In addition to the lack of maintenance fees and live customer care, Ally is topping the charts in online banking for its interest checking and high-yield savings accounts. Now the interest checking offers two different rates for those with less than $15,000 and those with more. The rate ranges from 0.10 percent to 0.60 percent. Not only will Ally offer you a reimbursement for up to $10 for ATM fees, but it does so for remote deposits as well. Along with an easy to use online interface, the online savings account offers a rate of 1.45 percent APY for those that keep a daily balance of $25,000. However, this account is limited to six transactions in a cycle. The banking division of Ally Bank also offers IRAs, CDs, and a money market. The CDs include a high yield, raise your rate, and no penalty CD with an APY of 2.00 percent at the highest and 1.15 percent at the lowest with a less than $5,000 deposit. Ally also offers the IRA CD in high yield and raise your rate, but also has an IRA online savings with a 1.45 percent APY on all balances. The money market account offers an annual rate that ranges from 0.90 to 1.00 percent. In addition to banking, you can also find several financial services like credit cards, auto and home loans, and investment opportunities. 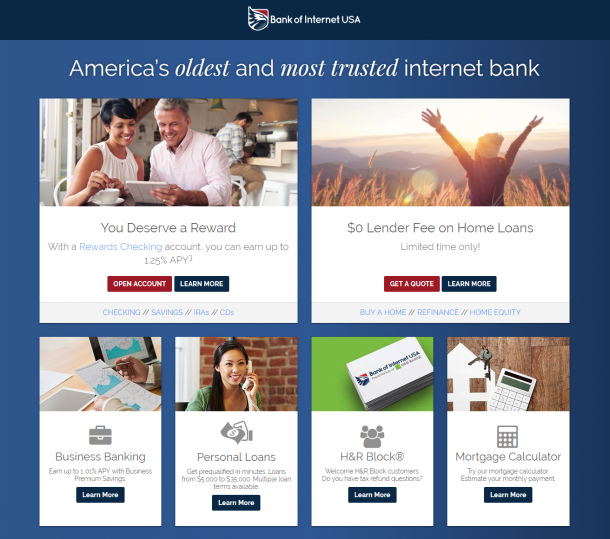 Offering an interest checking account with a zero balance minimum requirement is the Bank of the Internet USA. BofI USA was listed among the Best Online Checking Accounts of 2018 by Value Penguin, along with The Best Online Bank by Money in 2016 to 2017. Likewise, once you pursue this website's interface, you can see why this bank won these awards. Not only is this the oldest Internet bank, but it offers its customers different online checking and saving options. If you are looking for variety in your checking account, Bank of Internet USA has you covered with six different checking accounts available. This includes the rewards, platinum, cashback, essential, golden, and first checking. These checking accounts range from rewards with up to 1.25 percent APY to a checking account designed specifically for people 55 years of age and over. However, if this is your first time getting a checking account on your own, the first time or essential checking has you covered. The BofI USA also offers variety in the savings area too. You have the option of the smart savings with an APY of 1.30 percent, as well as the smart money market, traditional and Roth IRA, and CDs. 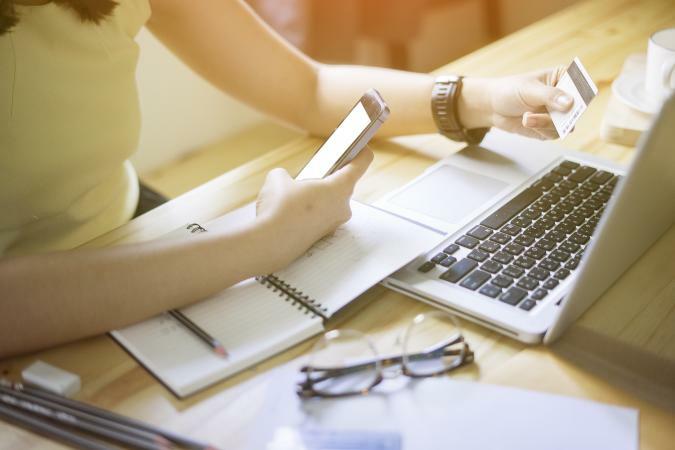 In addition to your typical checking and savings, you can find mortgages, personal loans, and business banking options like merchant services, which include POS terminals and mobile commerce options. Banks come in all shapes and sizes. However, if you are looking for a bank that offers several self-service options through online transactions and money transfers, there are multiple online options available for you. Some of the best options available based on awards are Discover Bank, Ally Bank, and Bank of Internet USA. These online institutions have limited physical options but do offer ATM services and a full service online presence.